Milton Obelle Bradley, Jr. is a retired Major League Baseball outfielder. Standing 6 feet and weighing 215 pounds, Bradley is a switch hitter who throws right-handed. Over his 11-year MLB career, Bradley played with the Montreal Expos, Cleveland Indians, Los Angeles Dodgers, Oakland Athletics, San Diego Padres, Texas Rangers, Chicago Cubs, and Seattle Mariners. His career was also mired by legal troubles and several notable on-field incidents. Born in Harbor City, California, Bradley attended Long Beach Polytechnic High School before he was drafted by the Expos in the 1996 Major League Baseball Draft. After playing four seasons of minor league baseball for the organization, he made his major league debut on July 19, 2000. In 2001, Bradley was traded to the Cleveland Indians in exchange for pitching prospect Zach Day; he was again traded in 2004 to the Los Angeles Dodgers. After playing in 216 games for the Dodgers, the most among all teams he has played for, Bradley was traded to the Oakland Athletics for Andre Ethier. 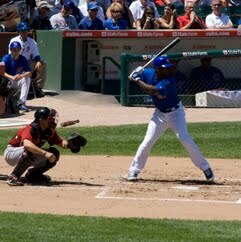 Bradley was traded to the Padres in 2007, was granted free agency after one season with the team, and signed with the Texas Rangers in 2007.